of back pressure with varying flow and viscosity characteristics. 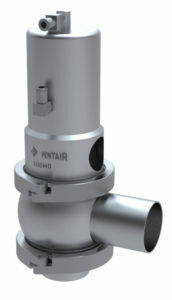 Pentair Südmo’s lip seal arrangement provides easy maintenance compared to valves that use diaphragms. It can be retrofitted into any existing system, regardless of manufacturer. With no automation required, the self-regulating air supply unit is set at installation and the need for adjustment is eliminated.